It’s been an amazing journey for some of these brilliantly talented skiers coming from all over the globe to compete for the glorious Golden Medals. Including British champs like: Elizabeth Yarold in Skeleton and Kristan Bromley, representing the Skeleton for Men. Sadly, Great Britain scored a rather unimpressive 19th place. 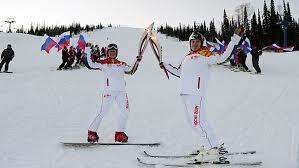 Winning this years Olympics in their home country was Russia, with a whopping 33 points, followed by Norway in 2nd with 26 points; trailing behind by one point was Canada taking 3rd place with 25 points. Last but not least, United States with a ‘Oh-so-close’ score of 28 in total but with not enough Gold medals leaving them in 4th place. But now, it’s time to say ‘goodbye’ for another four years as Winter games draws to a close. Click here to watch some of the highlights from the closing ceremony! Click here to watch ‘best bits’ from various winter Olympic games!